I didn't realize it at the time when I snapped this, but there's sort of an interesting illusion if you look at the background. 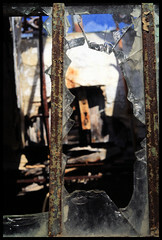 Some old broken section of the prison "looks" thru the jagged broken window. This was shot at the historic Eastern State Penitentiary in Philadelphia.